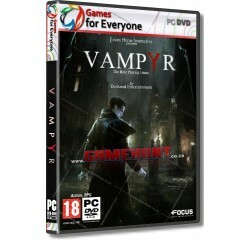 Vampyr - R180,00 : Game Hunt, Where we lead, others follow. Will you embrace the monster within? Survive and fight against Vampyr hunters, undead skals, and other supernatural creatures. Use your unholy powers to manipulate and delve into the lives of those around you, to decide who will be your next victim. Struggle to live with your decisions... your actions will save or doom London. SHAPE LONDON - A web of interconnected citizens reacts to your decisions. Processor - Intel Core 2 Duo E4300 or AMD Athlon 64 X2 4000+® or equivalent AMD® processor.